Daya’s big blue-and-white pavilion is one of the oldest structures on Pattaya Beach and while the bungalows have also been here years, they’re still worth considering if you’re on a budget. Average rating 6.3 from 39 reviews. Just beyond a string of upscale resorts at Pattaya Beach’s quiet western corner, Daya’s location is a big selling point. The beachfront here is marvellous and you can quickly stroll over a footbridge to the isolated Sanom Beach, or take the trail inland to an Urak Lawoi village, Sunset Beach and the western coves. Bungalows sport bright stripes in various colours that make them look like candy wrappers. Inside you’ll find worn beds set above linoleum floors along with bucket-flush toilets in the cold-water bathrooms. Decoration is limited to cartoonish stickers but, for the price, it’s tough to argue with the porches shaded by umbrella trees. Most rooms are fan-cooled but a few of the beachfront editions come with air-con. You can save cash by opting for an identical bungalow facing inland or a room in a concrete motel-style building at the rear of the property. If you prefer a broader vista and more secluded setting, opt for one of Daya’s larger wooden bungalow set atop the headland on the other side of Pattaya Song Resort, which has some rundown hilltop concrete bungalows of its own. A big group of islanders manage Daya and it always takes some effort to figure out who’s working and who’s just hanging around. While we’ve had mixed experiences with staffers over the years, the young man who most recently greeted us was polite and quick to show us as many rooms as we liked. WiFi is available but we wouldn’t expect much from it. Plus 200 baht for sea view. Fan-cooled. Plus 1,000 baht for air-con. Room: Dbl fan private bathroom, low season: 600 baht, high season 800 baht. Notes: In concrete longhouse. 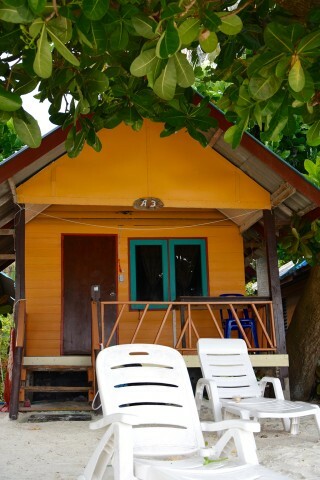 Room: Bungalow fan private bathroom, low season: 800 baht, high season 1,000 baht. Notes: Plus 200 baht for sea view. Room: Family room, low season: 1,600 baht, high season 2,000 baht. Notes: Fan-cooled. Plus 1,000 baht for air-con.